The plaster to the lower level was tested and any boast plaster removed and a scratch coat was applied to the remaining sound render in preparation for a “stone” tile to give a visually heavier base to the upper level which is to have a pale grey paint finish to the existing boarding. 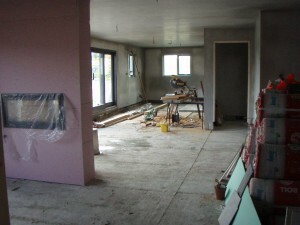 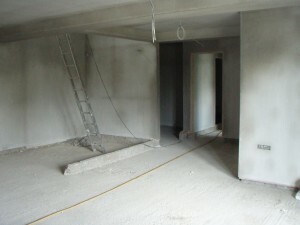 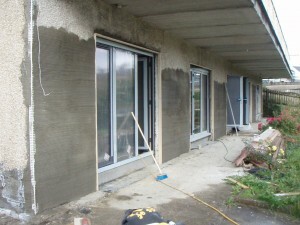 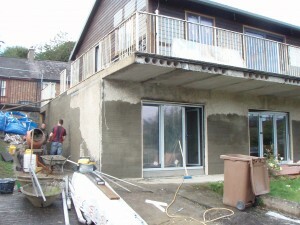 The three bedrooms, ensuite, bathroom, hot press and “chill area” were formed from lightweight block work and plastered. 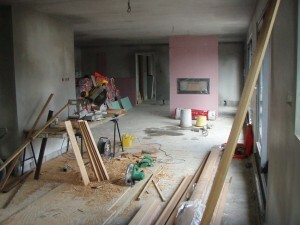 A new timber and stainless steel and glass stairs will come down in the centre of the “chill area”. The upper level stud work, plastered and skimmed and is almost ready for the insulation and screed. The two way gas fire has been installed and negotiations are underway with the gas companies to find a suitable supplier for the gas which will fuel the heating, cooking and stove.